Office Christmas Party is now showing in cinemas everywhere and is distributed in Australian by Entertainment One. Josh Gordon and Will Speck's Office Christmas Party is not much more than a stereotypical lewd party comedy with the likes of Santa Claus, a few Christmas trees and fairy lights thrown in to make it relevant to the season. The holiday season is closing in quickly at Chicago's Zenotek office and morale is low. Things are only set to get worse when CEO, Carol Vanstone (Jennifer Aniston) announces that she will be closing her brother, Clay's (T.J. Miller) branch down. In a last minute attempt to save their office, Clay, Josh (Jason Bateman) and Tracey (Olivia Munn) organise an explosive Christmas party to impress a potential client, Walter Davis (Courtney B. Vance) who could save their branch if he agrees to work with them. What ensues is a night of absolute mayhem which is a throwback to the work Christmas parties of old where anything goes. Perhaps the most unfortunate thing about Office Christmas Party is that when there is not a party involved, it is actually far from painful. The actual party itself is a colossal mash-up of as much crude humour that could take place at any event where a great deal of alcohol and drugs are being consumed. There is nothing subtle nor even remotely original about the film's attempts at humour during this time and it will take fans with this particular type of humour to conjure up a giggle or two. Yet, the script and humour involved before and after the party is quite entertaining with some great banter taking place between the main players including Jason Bateman, Olivia Munn, T.J. Miller and Jennifer Aniston. There are deeper themes involved including the ongoing economic worries that plague corporate business, but these more serious plot points are pushed aside so to make way for the grand attraction of Christmas party shenanigans. It's inevitable that Office Christmas Party will do well at the box office as during the few weeks leading up to the holidays, people are drawn toward seeing films that are in the Christmas spirit. The truth of the matter is that Office Christmas Party is really not much of a festive movie. It's disguised as a festive film by all the things which symbolise Christmas, which also includes the infamous work Christmas party. The screenplay could well exist without it being set during the Christmas season, but it would be unlikely to grasp the attention of the public and unlikely to have achieved the attention of the impressive comedic cast. It almost feels cliché to say that the cast (who are all highly respected comedic actors) are all underused in this film. It is completely evident that each tries to do all they can with the material that is given to them, but even those who are especially talented when it comes to improvisation (eg. Kate McKinnon and T.J. Miller) struggle to make something of merit. However, it would be unfair to say that Office Christmas Party is not funny at all if you are not a fan of dirty humour, as there are some moments which are very amusing. All the characters in the film are fairly safe and stereotypical of their surroundings, but each actor knows their character well enough (especially Bateman, Aniston and Karan Soni as Nate) to be able to fit into them comfortably and bring out the best in them. 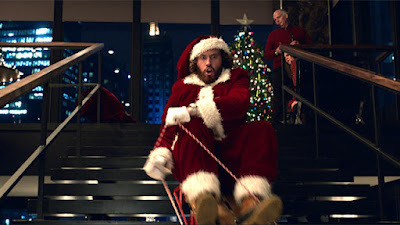 Office Christmas Party may not be the holiday fix one would like to experience at the cinemas this season, but is entertaining enough thanks to it's talented cast. You're playing a part in a fmovies usa.